One of my favorite books of all time is Little Women. I have sisters and I’m the youngest and it just always stuck with me when I was a kid. Plus I love all the movie versions. I haven’t read it in years but for Christmas my BFF Jess gave me this lovely illustrated version as one of my gifts and I just adore the cover. 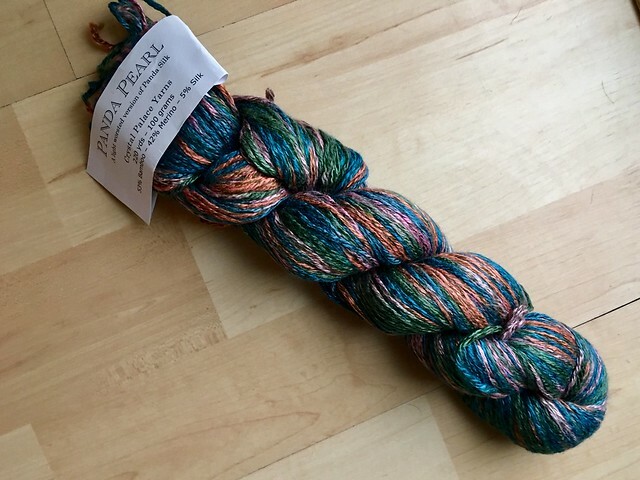 I think the colors seeped into my subconscious and made me order the Crystal Palace Panda Pearl yarn in Tropical Parrot because it was similar in color (minus the teal). I ordered this yarn without any real project in mind or without knowing how it would feel. It was on sale on Little Knits for 60% off. The skeins are typically $18.90 a piece and instead were marked down to $7.56 so I decided to give it a try – the description won me over. I’m so glad I did because it is the PERFECT spring/summer/fall yarn. It’s 53% Bamboo, 42% Merino Wool and 5% Silk and it feels so soft and light in your hands, it’s like a little cloud. The drape is also beautiful and the way the color worked up turned into a wonderful surprise with a slight sheen to it. I was sort of expecting stripes but instead I got this abstract camouflage print that I love. So when I got the wonderfully squishy hanks in the mail, I immediately decided the baby dress I was working on but realized I had twisted the join and didn’t care to cast on 188 stitches again could wait. I needed to make something with this squishy yarny goodness, but what? 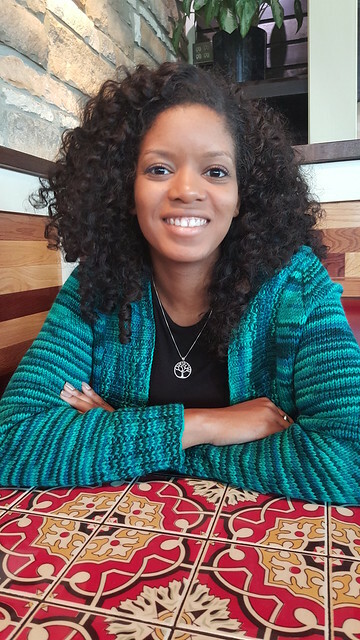 Ever since I made my cousin Safia the Lillian cardigan in this lovely green back in 2015 I’ve wanted one for myself. When she was visiting last month we talked about how much she loves that cardigan and wears it all the time. And I said to myself, I need to make myself a Lillian at some point and then I decided that I’d make it with this yarn but in a lighter, short sleeved version for spring and into summer. The end result is what I’m calling my Little Women Cardigan. It turned out exactly how I wanted it to in my mind. 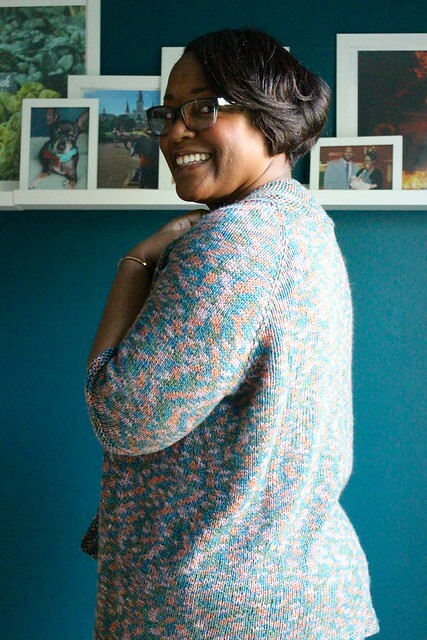 I made two small modifications: short, elbow length sleeves and since the yarn was much lighter and had lots of drape I opted out of a ribbed neckband and went with garter stitch instead. I think it was the right choice because ribbing would’ve just been too flimsy on this one. 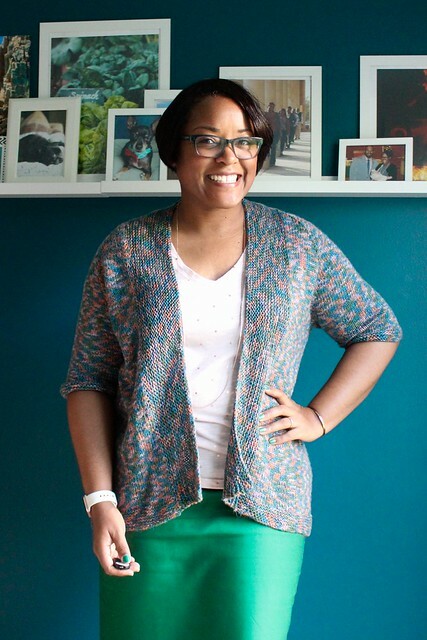 The cardigan has a deep green, pink, a peachy/muted orange and teal in it. It matches so many things in my wardrobe. And I can’t say enough how much I love how the color pools and creates this abstract pattern. To highlight the little bit of sheen in the yarn when I wore it to work this week I paired it with a pale pink tee with rose gold dots and a dark green pencil skirt. It wore well through the day and I had just a little bit of fuzz on the inside of the sweater from wear but the outside held up beautifully. I’m absolutely obsessed with this yarn and ordered a bit more in a gorgeous red and a natural cream color for another light pullover I want to make for fall. I still have 3 full skeins and about one 1/2 skein left and don’t know what I’ll do with it but I know I definitely want to make something else with this dreamy yarn. I totally plan on wearing this baby all the time because even though it’s only April my office is already freezing! Has anyone else ever given this yarn a try? Or what other kinds of dreamy yarns are out there that I don’t know about? Haven’t tried this yarn, but I think I might have to. Just need to get some projects off the needles first! I lllllllllllllllllove this yarn. Seriously. It’s soft and light and feels so good on. I cannot wait for my shipment of the next set of colors to arrive! I love Little Women, too! They were my sisters, as I had none of my own! I re-read it every few years—and pretty much start crying from the first page. 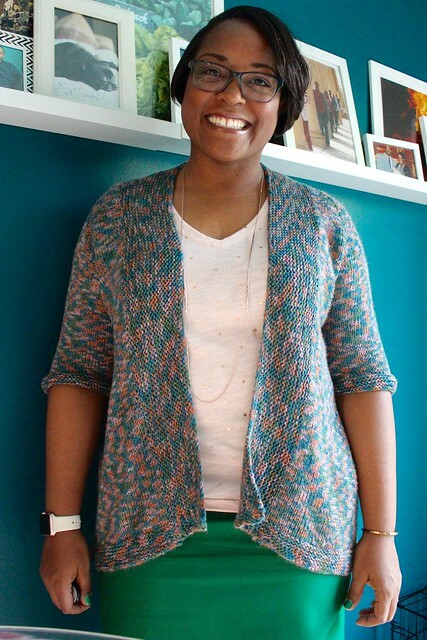 Love the cardigan and the pooling of the colors is great!! I may have to order some myself. 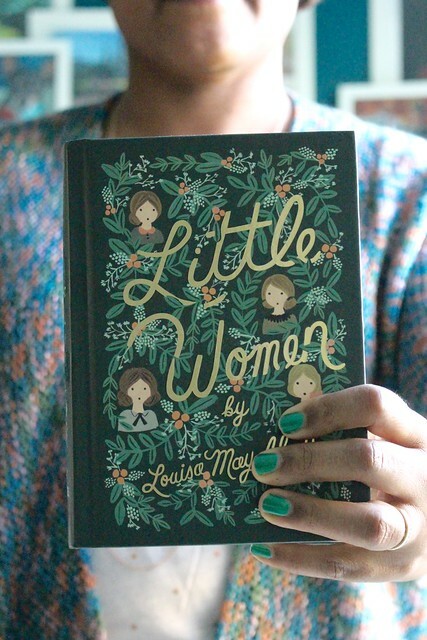 Love Little Women, and what a great idea!